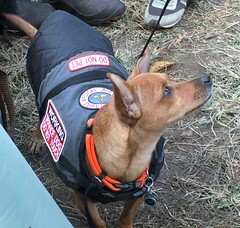 Some dogs even volunteer. They go to hospitals or “rest homes” and visit the residents, bringing love and joy everywhere they go. You might think that they bring hair and fleas, but the volunteering rules strictly prohibit dirty flea ridden dogs from volunteering. Of the joy that is all around us. That hope springs eternal – just watch that tail wag because the dog knows that no matter what you said, you will give them a treat just ’cuz. Just how special people are – after all, they like everybody. What about you? Do you have a calling? Do you love your work? Is your work your calling? Or is your calling something you just must do, whether you get paid for it or not? When I was a kid, the nuns taught us about vocations. At the time, there were three different types of vocations; single person, married person or religious. According to the nuns, all vocations were equal in God’s eyes. Each of us would somehow know what we were called to. All my life I’ve looked for my calling. I was left with a definite impression that there was something I was supposed to do. If I just could figure it out, I’d live happily ever after – because I’d no longer look forward to retirement, I’d love what I did so much that I’d never quit. Ortberg suggests that God isn’t waiting for us to be rich enough to have enough free time to “be better people.” Our work is one of our paths to being a better person. We have talents. We have strengths. AND we have challenges. When we put all these things together, we have the opportunity to grow – into the best version of ourselves that it is possible to be. This is true whether we’re being a Grandmother or folding clothes at Macy’s or pastoring a church, we all have the opportunity to be of service. Whether we’re getting paid for our gifts or whether we’re simply being given the opportunity to serve those we encounter while we’re getting paid to fold clothes, we always have the choice to serve. Ortberg points out that we never read of anyone in the Bible who gets to retire and go cruising the world. Why would Moses want to travel anyway? He’d already spent 40 years wandering around in the desert. The key isn’t what you do, it’s that you serve as you do. Look around you. What are your gifts? THIS is your life. No need to wait for it to get better. No need to wait to be discovered. Live your life as it is, TODAY. Do the human equivalent of wagging your tail in joy –SMILE. I know it seems hokey, but you never know when your smile will make THE DIFFERENCE to someone who has hit bottom. Do your best. Focus on your strengths and use them to serve. That is how you get to be the best version of yourself. That is where your true happiness lies. That is your true calling.